For the uninitiated, I am writing a Go-To-Guide for every runner who wants to do the Comrades Marathon. In the previous blog I focussed on my training and run up to the preparation for Comrades. If you missed it, just click here . In this blog am convering 48hrs up until race day including race day itself. Once in Durban, although we were to quickly pick up bibs on Fri and rest the remaining time on Fri and Sat, the expo was so festive that we ended up going there on both Fri and Sat and spent about 3-4 hours there each day! The bib pickup process was streamlined and smooth, and the goody bag was a really loaded one. It contained some free, useful consumable samples besides the bib, tshirt, a flannel tie-up top, and cap. It was an expo like never before for me – The novelty of the scale of operations, the smooth bib and goody bag collection, the innumerable cups of tea/coffee and cookies in the International Hospitality Area and the Novices Area, the photo sessions with the entire Indian contingent, the shopping – everything was so feel-good with efficient, helpful, and warm volunteers. I believe that all of the volunteers are runners themselves and most have run Comrades. I picked up some Comrades memorabilia, and Chandan also got taping done there. We handed over our tog bags on Sat to avoid having to do that before the run. These tog bags would be made available to us after the run at the finish. I put in a running jersey a full-length lower, a packet of RRUN post-run sachet, and the Comrades cap in it. As always before events, sleep proved elusive. I kept tossing and turning, and got maybe two hours of sleep; Chandan slept a little more. As is the norm, I got loose motions the evening before the run, not to forget the sudden hoarseness and loss of voice on Friday afternoon because I was still recovering from the earlier throat infection. The hoarseness went off almost completely just as it had come with some yoga, acupressure, and warm water. For the loose motions, I decided to take one immodium and one Vibact as well as carry one immodium to be taken in the morning. It is very important to anticipate and carry all the stuff that you might need. Not sure whether we can call it morning! I had set the alarm for midnight but was up before 10 PM. Saturday night just blended into Sun morning as we went about the early morning rituals, with my system in hyperactive mode! We went to the hotel reception at about midnight to pick up our packed breakfast comprising sandwiches, banana, and orange. Dinner the previous night had been at 6 PM and was very light. However, we weren’t really hungry. Got into a racer back tee, a half sleeves tee on that followed by a full sleeves front zip tee. Then realized that I hadn’t pinned my bibs. So lifted the two outer layers to put the bib on the back as well as the front of my racer back tee. I tied two belts around my waist with 12 gels (just in case I needed that many), 12 salt tablets (just in case I dropped some), a copy of my passport (never know when it would be needed), some tissue paper (with my delicate bowel condition, I wasn’t sure of anything and it was going to be a long day), and running sunglasses (which I wasn’t even sure I would use) besides hanging a visor cap by one of the belts. I wore a bandana to cover my ears and covered my hands with a pair of half gloves and another pair of long socks on that. You see, I am a warm weather person who doesn’t mind running as much in the afternoon under the sun at 35 degrees, but is too scared of even standing around at 8 degrees. So just as we left, I also tied the fourth disposable flannel cover provided in the goodie bag. The pre-booked cab arrived on time at 2 AM and we rushed early from Durban to Pietermaritzburg to beat the traffic and the road closures. Because we had started early, we reached early too. I moved to the front of the enclosure to save the whatever seconds I could. This time was the most challenging time of the run for me. It was really cold despite the layers. We had to either stand and get tired, or sit on the road, and I am not the kind who can sit on the ground comfortably for more than 2 min. It was a long wait of about two hours. I had to visit the washroom once during the time. I couldn’t see any of my friends who were also supposed to be in this same enclosure. I wasn’t carrying my cell phone, so I had absolutely nothing to kill time. This was the only time during the run that I thought that I would NEVER WANT TO GO THROUGH THIS AGAIN. I was bored, stationary, and cold! Time passed very slowly. And then I suddenly found something warm. It was Chandan holding my hand. They had dropped the ribbon of the H enclosure and he had come ahead seeking me out. Then we both got chatting, and the G enclosure ribbon was also dropped and we moved up to the F people. Slowly it was time to run…the ‘cockadoodledoo’, South African National Anthem, Chariots of Fire, starting shots, all set the mood. However, the minutes passed so slowly while nobody really moved! Finally, we were moving! If I rate my confidence level on completing the run, it was 8/10. But there was a big “if” to this…. If my foot/ankle injury that had been troubling me through the training period did not flare up again. Of late, my foot had started paining even after shorter runs, but recovery was also faster. I sent a prayer up to the heaven as Chandan and I stepped off the start mat about 7 min after the gun-shot. I had complete confidence on my training and was reasonably sure I would finish the run…but there are so many unknowns and so many things that can go wrong in such a challenging run. And then there was this target also to be achieved! Initially it was dark and crowded so I had to run very slowly and carefully because I tend to trip and fall easily. In a way this was good because I have a tendency to start out early and burn out later. For about 2k, Chandan and I ran together, and then he asked me to go ahead although he stayed quite close behind until past the halfway mark. Hence, almost through the run, I was on my own, doing a solo run surrounded by hoards of other runners. 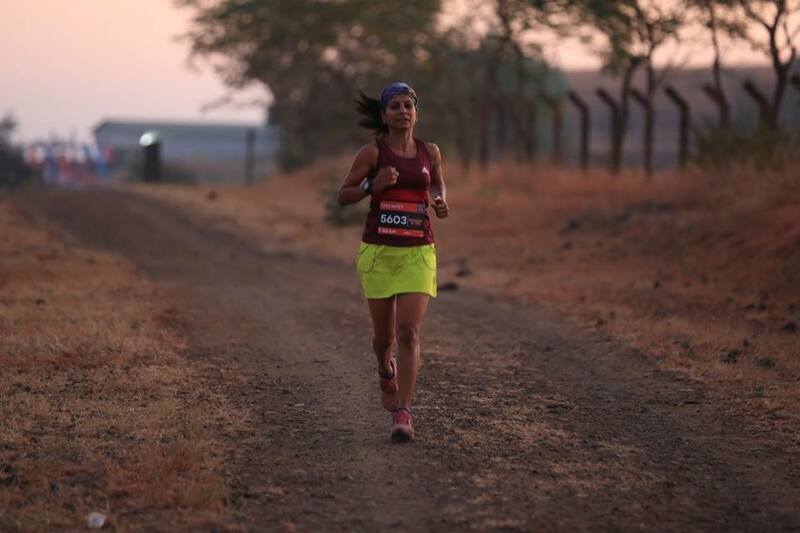 I crossed just a handful of other runners from India, all going their own pace as is typical of an ultra. Just a few fortunate ones get an opportunity to run with a buddy. Otherwise, we have to be mentally prepared to run alone, something that I am quite used to because of my solo training runs since I started running. I had run just about 5k when I felt that my bladder was full. It was the cold and the wait before the start. Two ladies went into tall grass on the side, and I immediately followed them to take advantage of the dark. The port-a-loos had long queues then. I stopped for loo breaks four more times during the run, and twice I had to wait in a queue. After each loo break, I did some quick stretches. I firmly believe that this was a good time investment, and these stretches helped me in going strong without injury or cramps. Although the first sign of cramps came in as early as about 30k when, strangely, I felt that my quads were going to cramp. I slowed down immediately and took my salt tablet that was already due. Later during the run, I felt that the calves would cramp and also the hams, but each time I slowed down and did the stretches too as needed. The miraculous thing was that by the end of the run, I had experienced aches and soreness everywhere except that injured foot/ankle. Almost everything else was hurting, but there was no swelling on the foot, and both the foot and the ankle did not hurt at all that day! The typical thing about this run is the support and cheering enroute, it is almost like a carnival that helps the runners enjoy the run. I often heard my name being called out by absolute strangers along the road, cheering me to go on. This infused new energy and brought back the spring to my step. There were kids along the route to collect the extra discarded layers of clothing. There were designated boxes along the route for throwaways. The first thing I discarded within a couple of km was the fourth layer of my flannel cover followed by my pair of socks worn over the gloves. There had been instructions to not discard the layers at about 15k when it becomes a little warm because after running down Polly Shortts it is cold again. I kept that in mind and then discarded the third full-sleeves layer and half-gloves. And somewhere later, I handed over the half sleeves tee and the bandana to a girl standing by the road. Time became irrelevant for these details, somewhere along the route, I wore my visor cap, and for about an hour late afternoon I wore the sunglasses too, though I never really got comfortable with those. Besides, it was a cloudy day for most part. I took the salt tablets and the gels – eight each – more or less as planned and ran as I had trained. I also had Energade as needed and orange slices, salted ones on some aid stations. In the last 30k, I also had coke on some aid stations. I didn’t take any walk breaks in the first 12k, other than the one loo break at 5k. And then decided to stick to the training strategy. I maintained an average overall pace of 7:05-7:10 most of the time, just once crossed 7:11. when I reached the 30k mark, I remembered thinking that I have already run the remaining distance in the training run, so just had to continue the same way! But then, I also remembered that someone had said that the real run starts after 60k, so I just decided to keep going steady. When I tended to slow down, I thought about the good wishes I had received from so many friends. Also thought that it would be a repeat case of starting out too fast in the beginning and then losing steam later. I was so tempted to stop for an ankle and hams massage, but I had resolved that I would not stand or sit anytime during the run. I drew more energy from within… said to myself that I had already run a 100K, stayed on the road longer, and trained well at higher inclines. I knew that if I could stay within target until about 58k, the chances of a sub-11 would be quite high. Provided, of course, there were no cramps, injuries, or tummy issues. 58K, and I was about an hour plus ahead of the official cut-off time. I had to sustain the same effort to maintain the cushion and achieve my target. My spirits rose and I resolved again to keep going strong. When I reached the last cut-off and just 9k was left, I decided to not push myself and risk injury. I decided to continue with the same effort because that would still ensure that I did a sub-11. Just enjoyed the run all along. And soon, I was on the last Toyota mile. My smile grew wider and I opened out the lower two pins of my bib and removed it from under the belt so that I would get clear, identifiable by bib finish pics :D! I ran along the longer side of the curve to be able to wave at the camera. I was in no hurry to finish my run and was soaking in the atmosphere with so many people lined up outside and cheering the runners. There was a feeling of complete exhilaration on entering the stadium and seeing so many people there! I ran easy along the track, stepped out before the finish towards the camera on the side, bowed to the ground, my coach, and all my friends and well-wishers. Then I got back to the main track and ran across the finish mat. As soon as I received my medal, we were identified by our blue bibs and escorted to the international area. The first known person I met there was Deepak Ingawale. He congratulated me and told me that Chandan was not too far behind (he finished in 11:17, someone who wasn’t properly trained and wasn’t even sure of completing). It was such a relief to hear this; in fact, this was my best moment of the run! I was so happy to hear that he was still running despite insufficient training…now that’s a different story and can be read here https://www.facebook.com/chandan.mateti/posts/10216541850285917 And then I met the other Indian runners who had finished; it was all hugs, smiles, and pics after that! I finished my run in 10:53:02 with reasonably good splits as shown in the pic attached (timing.jpg). In fact, for the first time in my life I had a negative split in any run of 21k and beyond, thanks to the training and more downhills in the second half! We did a recovery walk on the beach on Mon morning and headed for a safari on Mon evening! Thanks Jitu. See you too there soon!